In this lesson, we're combining the conventional flat-picking technique with fingerstyle – more widely known as hybrid picking. An advantage of this method is the ability to incorporate simultaneous ‘piano’-style triads and intervallic skips, with the option to change to alternate picking at any point. Holding the pick between thumb and first finger, I’m using the second (and sometimes third) fingers to play up to three simultaneous notes. The pick takes the role of what would be the thumb if playing completely fingerstyle. So why not use a thumbpick? Well, Chet Atkins and Tommy Emmanuel are among the players who have done so – though this tends to lend itself more to solo guitar arrangements where independent basslines and melodies are more intricate. 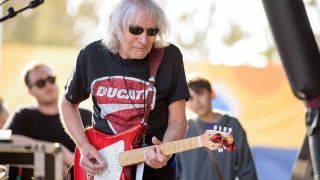 Hybrid picking seems to be the preference of those who play more single-note lines, using the extra fingers more occasionally, like Eric Johnson or Albert Lee. You can also add more dynamics using the fingers to ‘snap’ the strings back against the fretboard. Even without a bright tone set on the amp, you can make notes pop out of the mix. Though there are rhythm guitars on the backing track, I’ve opted for a strong start by playing an A5 chord, jumping straight into some A major pentatonic ideas in the same position. Over an A5 chord, there is the freedom to change between major and minor, so I’ve taken advantage of this in bar 2, shifting to shape 1 of the A minor pentatonic. In both cases the second finger is brought in for a percussive attack and simultaneous notes. Staying with the A minor pentatonic until almost the end, I’m demonstrating a couple of different ideas here, often using fingers two and three. There’s a lot going on here (with potential for lots more), so it’s worth spending some time on this example. Don’t miss details, such as the occasional staccato note – and accent the rhythm of the phrasing by digging in with the pick and/or fingers, too. Alternating between pick and second finger allows some rapid-fire stuff, as this example shows. It’s actually far easier to play a phrase like this with hybrid picking than with conventional techniques. This is just one example of many possible licks, though this harmonica-style trill seemed to add in a more blues feel in what was rapidly becoming a country solo! Note the third finger comes in for the descending triads in the second bar. I haven’t included picking-hand instructions here, as this would make it seem like I’m using a definitive method, when this really isn’t the case. Working through the phrase, you’ll most likely find your own preferences, though this is basically pick and second finger, like the last example. If you still feel unsure, checking out the video will probably give some valuable info for what’s happening when – including hand posture, etc. Finally, a longer phrase… we may as well finish the whole solo while we’re here. These sliding sixths use the pick and third finger to skip the second string much more easily than with conventional flat-picking. For bars 3 and 4, I’m using fingers two and three together, with the pick providing the lower notes. This is most apparent in the final bar, which may actually make a great warm-up for this technique.